Mud flats and sandy beaches. Visit the Chesapeake Bay region in autumn, winter and spring. Most often seen in the lower portion of the Bay. The sanderling is a small, pale sandpiper with black legs and a straight black bill. It visits the Chesapeake Bay’s beaches and tidal flats from autumn through spring. Sanderlings have a small, stout body that grows to 7 to 8 inches in length with a wingspan of 14 inches. Their plumage is brownish-gray in spring and grayish-white in winter. They have a white belly and a broad, white stripe bordered by black on their wings. They have a straight black bill and black legs. 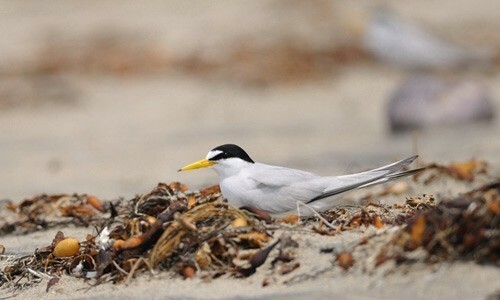 This bird eats small, beach-dwelling animals such as bristle worms, amphipods, mollusks and crustaceans. 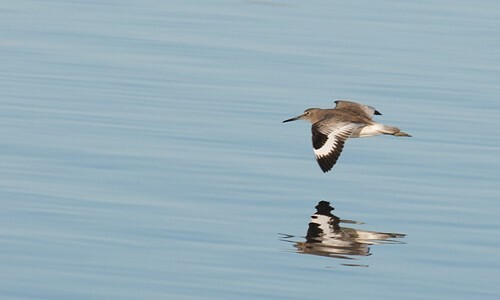 It feeds at the water’s edge by probing the sand with its bill. Small flocks dart along the water’s edge, quickly running away from incoming waves. Few predators exist outside of the sanderling's breeding grounds. Sanderlings fly in flocks. 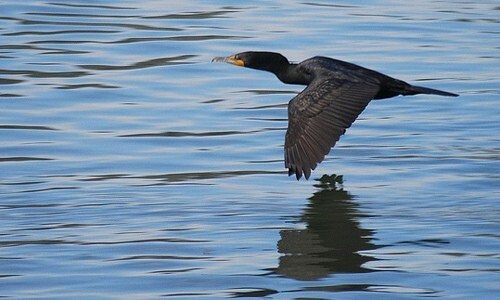 Their white wing stripe is visible during flight. If disturbed, they will quickly fly away. Usually silent, sanderlings may make a soft wick-wick sound. Sanderlings do not nest and breed in the Bay region, instead breeding on islands along the rocky coast of the high Arctic tundra. Once their chicks hatch, sanderlings migrate south through the Chesapeake Bay region for the winter. They can live for 13 years. Sanderlings are one of the most widespread wintering shorebirds in the world. They can be found from Massachusetts to the tip of South America. They are the only sandpiper that lacks a hind toe. This allows sanderlings to be strong runners.